It's rare to find such a high payout attached to a business that's posting record profits. A stock dividend that's much higher than the market's 2% yield usually comes with unattractive trade-offs. Either the shares have been pummeled by weakening operating trends, the business' outlook is deteriorating, or the company is paying out an unsustainable portion of its (declining) earnings. Occasionally, though, you'll come across hefty dividend that isn't marred by any of that baggage. That's exactly the case with specialty retailer GameStop (NYSE:GME) and its juicy 4.8% yield. GameStop built its business around video game retailing, where it is now the largest player. In particular, the company's buy-sell-trade model helped it establish a dominant position by making it easier for gamers to own titles that can cost $60 a piece brand new. Yet that business is impaired by two big weaknesses. First, it's shackled to a video game console cycle that adds uncertainty and volatility around new gaming device releases every few years. Second, and more important, it's being disrupted as gamers move their spending online. Obviously, every game that's downloaded rather than purchased in physical form is one less title that could contribute to GameStop's profitable buy-sell-trade ecosystem. This is why CEO Paul Raines and his executive team have made it their mission to diversify into complementary businesses. In fact, management aims to have over half of GameStop's operating earnings come from sources other than physical video game sales by the end of 2019. They're already making big strides in that direction. Gross profit from other business lines, mainly mobile phone services, consumer electronics, and collectables, was 25% of the total last quarter, up from 16% in the year-ago period. Success in these new segments powered not only an increase in profitability (net margin rose to 4.3% from 4.2%), but also a boost in overall earnings. Okay, so the retailer's operating trends are strong, but is its dividend sustainable? You bet. Its $1.44-per-share annual payout was easily covered by the $3.80 per share it generated in earnings last year, and will be better protected by the $4 per share that GameStop is expected to produce in 2016. 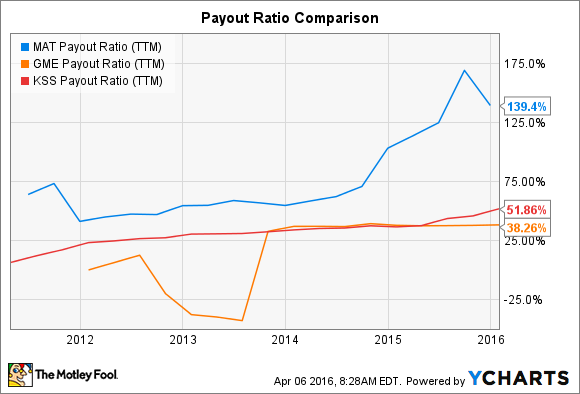 Compare that sub-40% payout ratio with other high-yield dividend payers like Mattel (NASDAQ:MAT), whose entire net income was swamped by dividends last year, or even Kohl's (NYSE:KSS), which pays out over half of its profit in dividends. MAT Payout Ratio (TTM) data by YCharts. In addition, Kohl's profit fell 22% last year and is down 40% in the last four years. Similarly, Mattel's slumped by 26% in 2015 and is down 50% since 2011. In contrast, GameStop's $400 million of profit set a record for the company last year and management projects another increase in 2016. One of these retailers is not like the others. GameStop's strategy and finances just don't fit with the (persuasive-sounding) thesis that the retailer will fail due to its reliance on selling a physical product in what's becoming a digital industry. It's not the next Blockbuster. Yes, the company will need to adjust as downloading eats up a bigger slice of the market, but investors don't have to spend a lot of time imagining what that change process might look like. It's already happening, and the shift into selling mobile services and consumer electronics is making GameStop more profitable, not less. That's a rare situation to find in the small universe of stocks yielding close to 5%.